A month ago I was in Houston for both Quilt Market and Quilt Festival. 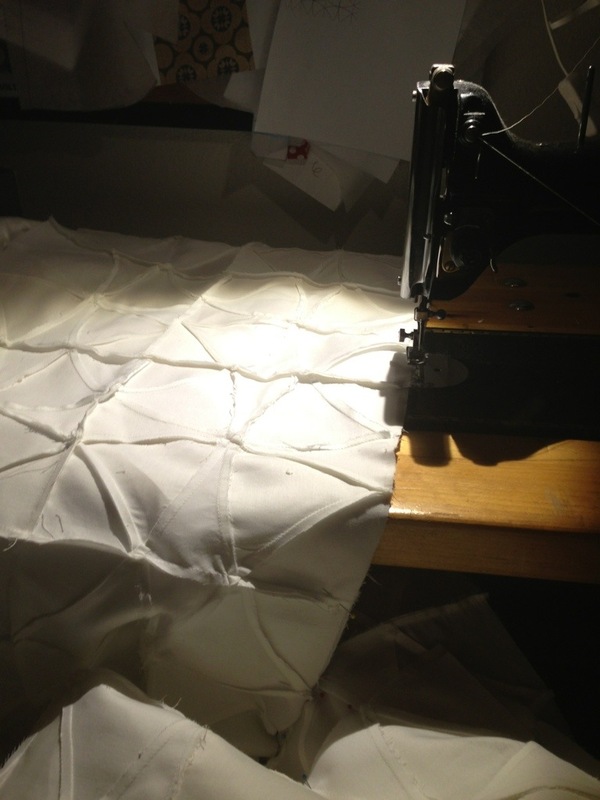 Two weeks hanging out in the Shannon Fabrics booths during the day and in the hotel room at night. It was super fun and super duper tiring. My favorite part of these eventsis seeing what is happening out in the quilting world. I don’t get to shops very often and rely on the Internet too much to keep me abreast of what’s new and exciting. So getting out and walking the aisles at Quilt Festival was a real treat. I’m a sucker for a good challenge and this one ranked right up there. I’d brought along my Singer Featherweight so I didn’t have to go weeks without sewing (because you know I’d lose my mind). I pulled the little machine out of the box that night and started piecing the laser-cut square-in-a-square bits. You don’t even have to look that closely to see that most of them aren’t even real squares. The 1/4″ seam allowance wasn’t perfectly straight on each one. Angles ended up being slightly wonky. But that wasn’t the point of this project… I just wanted to make it for my mom. I could do it perfectly and make it frustrate me. Or I could just sew it up because I love my mom and know that she likes purple and she won’t care that it isn’t perfect because either am I and she still loves me. I sewed after Quilt Festival closed each night and spent a few more days working on it after Festival and before I went back home to Los Angeles. The need for perfection is there, assuredly, and there were a few times I had to take stitches out to get it slightly closer to perfect. But my mom is worth it. 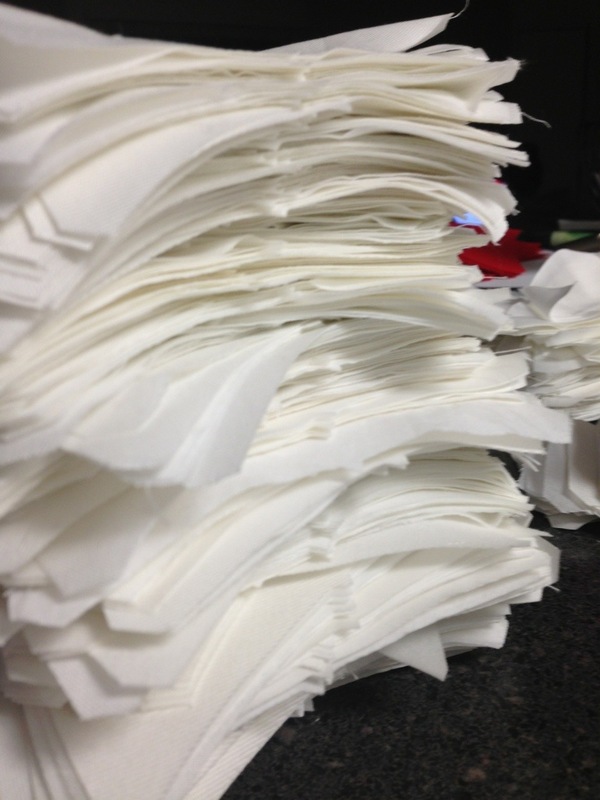 I sewed the sections, one bit at a time until I could lay them out on the floor. I was hoping I could get some cool layout with them, but truthfully Quilt Market Hangover is real and when you add in a little Quilt Festival Hangover, too, my brain was just too too tired to do anything really fun with it. I convinced myself that it was pretty enough as is. 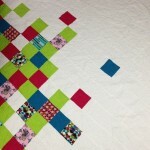 Each quilt block finishes at 4 1/2″ wide (ish), so room for error was basically nil. Most of these blocks didn’t come anywhere near the perfection that I had wanted and there were a few times I had to talk myself out of simply throwing them all away. Those little overhangs and wonky intersections that don’t match… Even now they kill me a little, but this was an exercise in just letting go. Let it be. Don’t get stressed out about it. Just do it with love and acceptance. This mantra repetition was so hard for me, to be honest, but I knew I needed it. I can be ridiculously hard on myself for no reason. I’m sure I’m not the only one either. 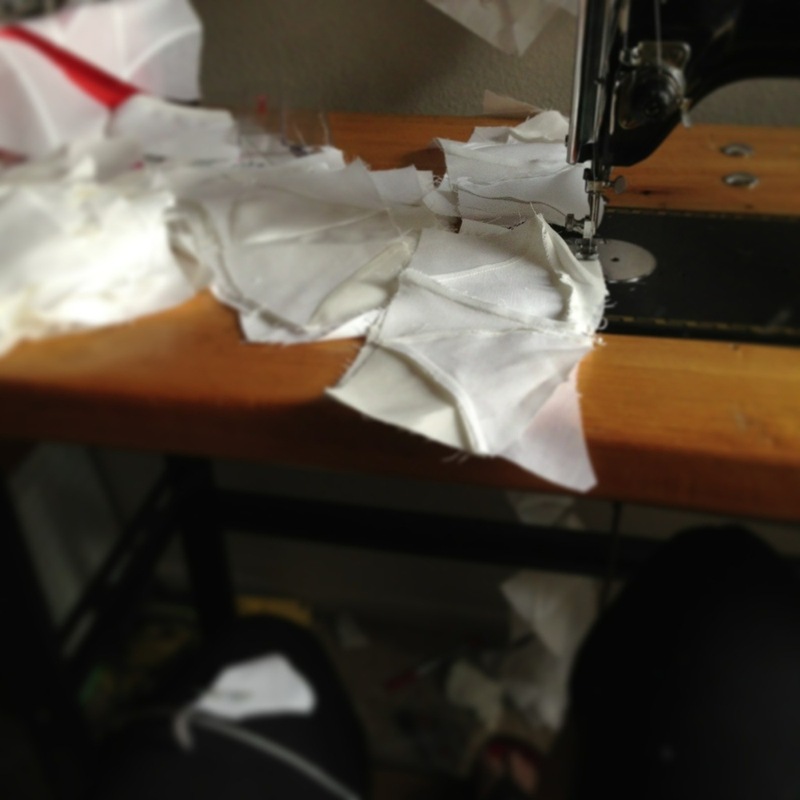 We can all pick on ourselves more than we should and there are so many times where the internal berating has made me do some dumb things (take a rotary cutter to an imperfect quilt block, throw away an unfinished dress, toss out patterns). None of these things make me feel better in the end; they only reinforce my self-bashing. I swore I wouldn’t and I didn’t. Instead I just worked through it, tried my best without getting angry for the mistakes and finished the whole top. As a whole, I thought it was beautiful and I convinced myself to stop looking at the little bits. Take in the big picture–it’s a lovely little quilt top. But it needed to be quilted and I really, really am not good at that one yet. I gave it a try on my regular Pfaff 130 with the industrial motor. Great for piecing, not so quilt for quilting this guy. Despite using a walking foot it would get help up on seam intersections. It didn’t stay straight. I quilted about half of it. Had a good cry and picked it all out. I took it to the Featherweight instead and that little beauty did it as well as I could have ever expected. I have a lot to learn on how to make the quilting look good and keep it even, but hey, it turned out. It’s usable. I won’t be humiliated to have my mom hang it in her home. I’m not perfect. Either are my quilts. I’m learning that that’s okay. 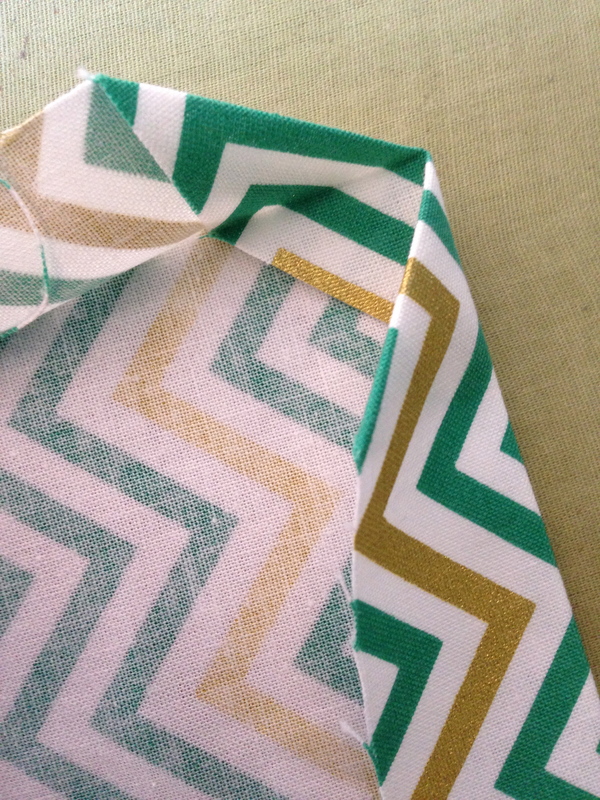 I love how the fabrics play together and am so glad I held on to the Indie bundle for all this time. The view from above. 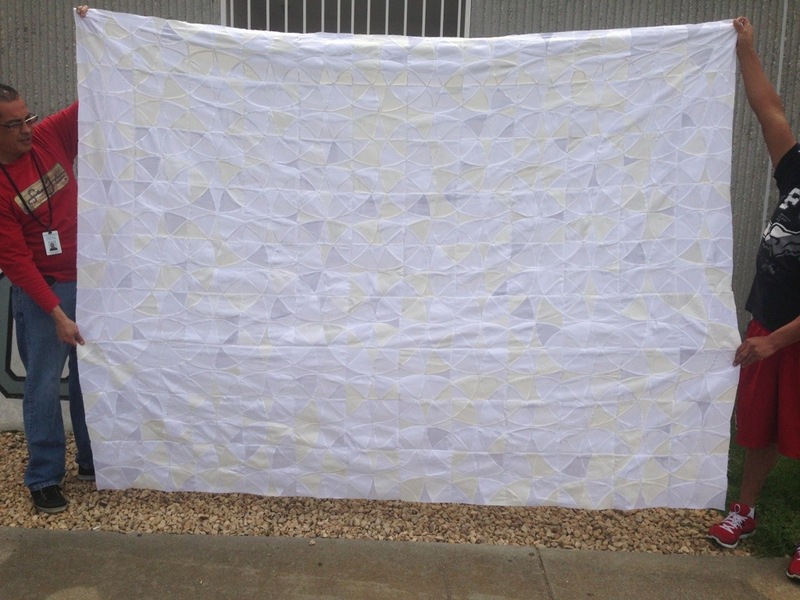 Right now it measures 48″ x 42″ (approx) and is great crib size quilt. I’m pretty sure I’m going to keep growing it though. 🙂 It’s fun to compare this quilt to what John originally designed in the red and white combo and what he shows in “A New Spin on Drunkard’s Path” with the black background. And honestly, this is one of my favorite aspects of quilting–the never-ending ways you can put together the same thing. Same block, same construction, totally different look. It keeps quilting fresh and fun and intriguing to me. I got a bee in my bonnet about the Fancy Forest quilt last fall and managed to get Fabric Depot to agree that we should do a quilt along class for it. Then I somehow put together a bundle of Me+You batiks in a color array that dozens and dozens of people liked well enough to buy. 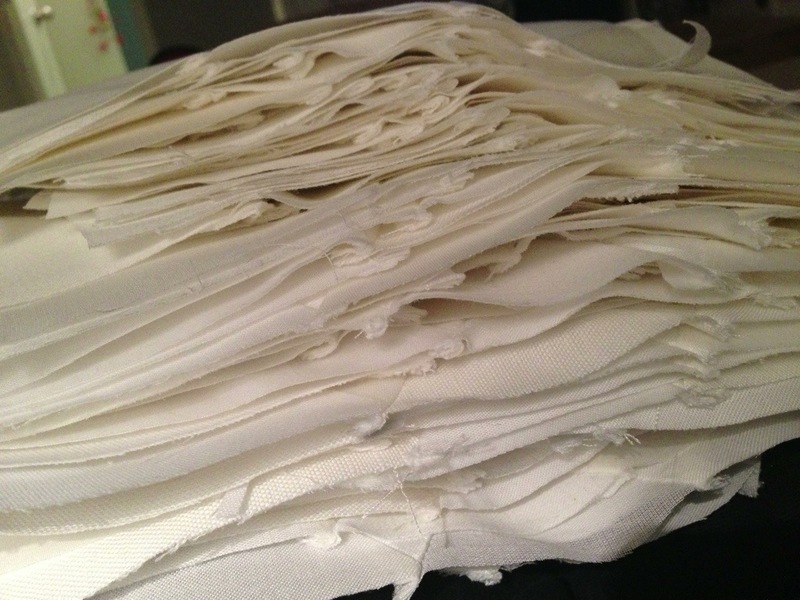 This last part makes me ridiculously happy because let me assure you…it was so much more stressful doing a pull that requires a shop to buy 8o bolts of fabric than for me to pull 40 little fat quarters from my stash. Yikes! But so far it’s worked and we started our first session of the Fancy Forest Quilt Along on Sunday with 30 students and another 12 the next day. I did a small pull for myself to work through the quilts with my students. Not surprisingly, I chose more of the Me+You batiks. I just love their slightly dusky hues. I talked about tools and quilting and the wonders of this quilt for a good 45 minutes or so before I let them get to work. I like to talk, what can I say?! Then they got busy measuring and cutting. More than half the class is using the bundle, which is awesome, but it’s also super great to see all the other variations of fabrics that people have chosen. Already I’m so looking forward to how these quilts turn out. 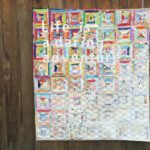 How awesome will it be to see 40+ quilts from my students? So very awesome. And only 9 more weeks, ha! 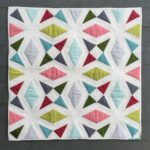 If you are interested in following along, you can join us on the Fabric Depot blog and/or on the Facebook group: Fancy Forest Quilt Along. I’ll be posting on both the @fabricdepot Instagram account, as well as my own (@teresacoates). The first time I heard someone say this I audibly gasped, horrified that anyone would put off pressing. But the mm-hmming of those around me made me realize that it was a common sentiment. 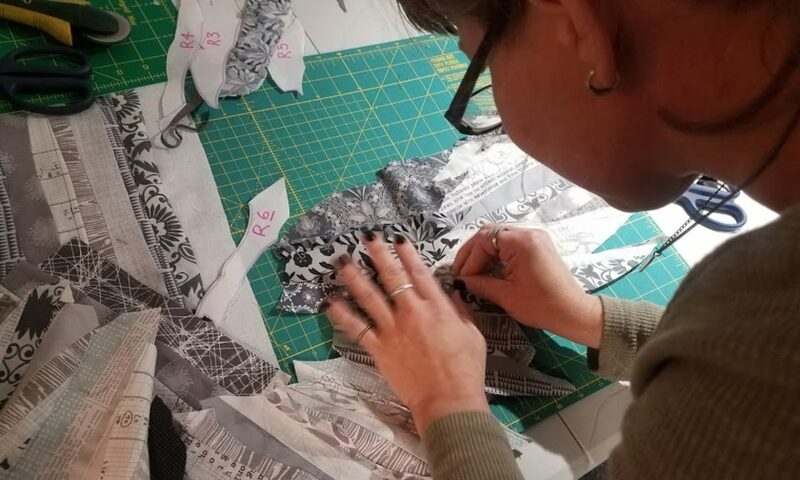 As a long-time garment sewist, the need to press as-you-go has been drilled into me, but many quilters and new garment sewists don’t realize the difference it can make in the final outcome. This is what has been filling my off-hours lately. I have 400 log cabin blocks to make: 200 of one variation, 200 of the other. I started with all those red squares and have been adding row after row of thin white, then thick black (per LUKE‘s instruction). It’s awfully fun to see them come together. It can be a little fidgety though sometimes. LUKE uses discarded garments for the pieces, so there’s always a wide variety of fabrics types and sometimes they don’t play well together. I’ve already melted through a couple of polyester pieces. Some ravel a lot. Others stretch badly. So this requires pressing, measuring and trimming after each row. My current living space (less than 600 sq. ft) isn’t super conducive for this set-up, but it is what it is. I’ve got one more row to do on this first batch of 200. They are stacking up quite nicely if I do say so myself. I’ve got a little Fabric Depot work and some PMQG chores, but then I’ll get back to these later this weekend and maybe by Monday I can start the next 200. You can follow along with this series of log cabin quilts that LUKE is having made by searching the hashtags #sewingforLUKE and #LCoDJ on Instagram or read about it here. Last month I participated in Jennifer Sampou‘s Black and White Collection blog hop via the work blog, but I’m so happy about how it turned out, I just wanted to share it here as well! We got to choose our own pattern (or make up our own) for each stop along the way. I’ve learned to really love this Winding Ways block and wanted to use that. I set to work with a pencil and a Winding Ways blank template. One of the things that I really love about this pattern is all the intersecting circles and how they play with each other depending on where you put color and where you don’t. I can sit and color in those blocks for hours, erasing and re-arranging until everyone has locked the doors and gone home. I can’t say I figured this out on my own, either. 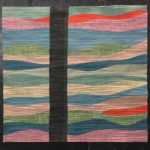 It was thanks to doing work with Luke Haynes on this Moda quilt that I learned just how entertaining this traditional block can be when fiddled with. I played with it until I settled on a design, got the fabric and set to work on cutting out the pieces (thank you, Accuquilt) and piecing, piecing, piecing. I did a lot of these blocks one at a time, which I tend not to do (I love chain piecing more than almost anything), but since it was a pretty finicky pattern and I was making it up on the fly, I needed to get it right. If you look close enough, though, you’ll notice that I didn’t get it quite right. Let’s call that a “design choice” or a “only God makes perfect things” decision. The quilt was featured on the third day of the hop and I was super happy to see it get so many likes on Instagram. I know, it sounds silly and superficial, but really…it’s hard putting your work out there to be judged. And I’ve seen more than a few designers ripped a new one over their designs and it is not pretty. Luckily this one was liked. So I asked my boss if we should do a pattern through work or if I should do it on my own. She said they’d do it (which is great because their graphic designer is WAY better than I could ever be). 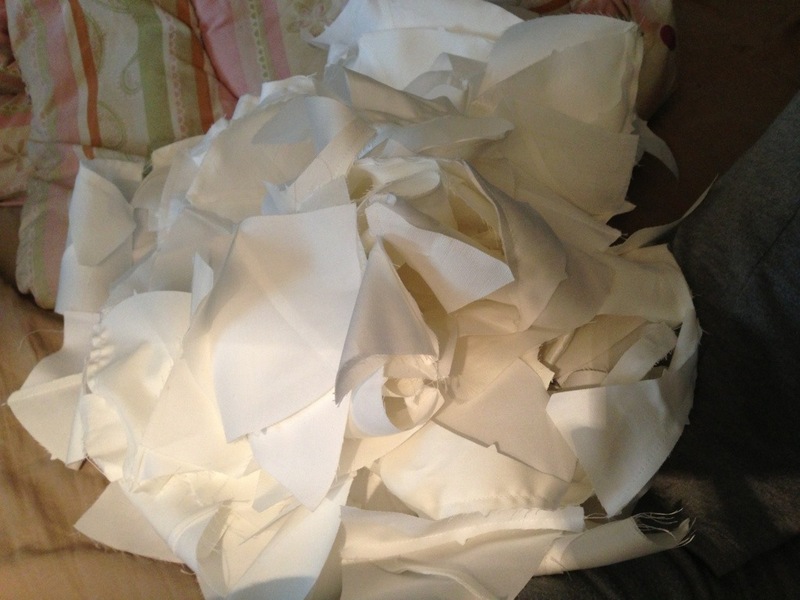 I wrote up a few guidelines, figured out quantities and then “tested” it with paper pieces. Then wham-bam, there was a pattern! 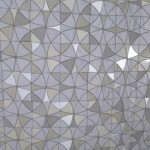 And you can get it for FREE from Fabric Depot: Supernova Quilt. 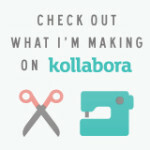 In March I’ll have a little quilt along for those who are interested in making your own version. 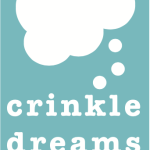 I’m still working out the details and trying to figure a workable timeline for everyone, so if you have feedback on what you want/like/hate about quilt alongs, leave me a comment. I’d love your input! Can you believe it’s September already?! This summer has just flown by but I’m super happy to report that the sun is still shining here in Portland. We had one cloudy day last week, but it’s back to blue skies, sunshine and supposedly into the 90s again this weekend! I may be one of the few Portlanders who actually love the forecast of continued heat. Blame a year in California with sunshine every.single.day. September means things start changing and the daughter goes back to school. We’ll get back to a routine of work/school days with homework and weekends for fun. I’ll be teaching again and I’m thrilled. Plus I have a few consulting gigs starting this month and the pincushions and pillows are coming right along. I’ve got Kell’s quilt started and Luke’s is cut out. So are both the garments for class. At least there is a bit of a jumpstart, but this could very well take all of September if I’m not careful with my time. So I’m up early again today, did some yoga and now it’s down to the studio to get cracking on that list. Welcome to September. My favorite pic from Luke’s show at Blu Dot, simply because it shows off the sheer bits so well and she caught my little car parked right underneath it. 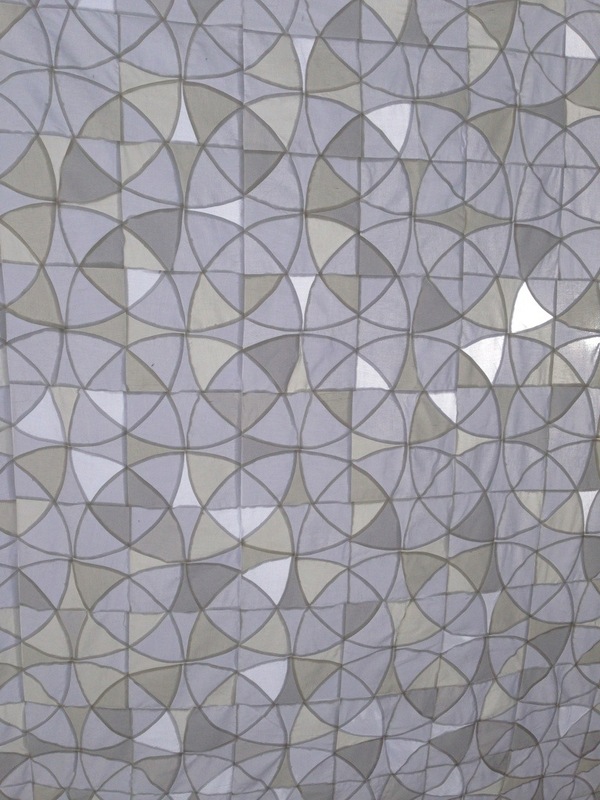 Recently I had the opportunity to work on yet another quilt for Luke using the Winding Ways traditional quilt pattern. 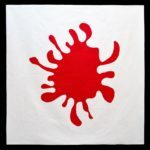 The 72″ x 96″ quilt is made with 10 different variants of white fabric, including sheers, twill, quilting cotton, silk/cotton blend, and more. It made it a challenge to sew, mixing fabric weights, but using spray starch on the lighter-weight fabrics made it much easier to combine them without too much swearing.